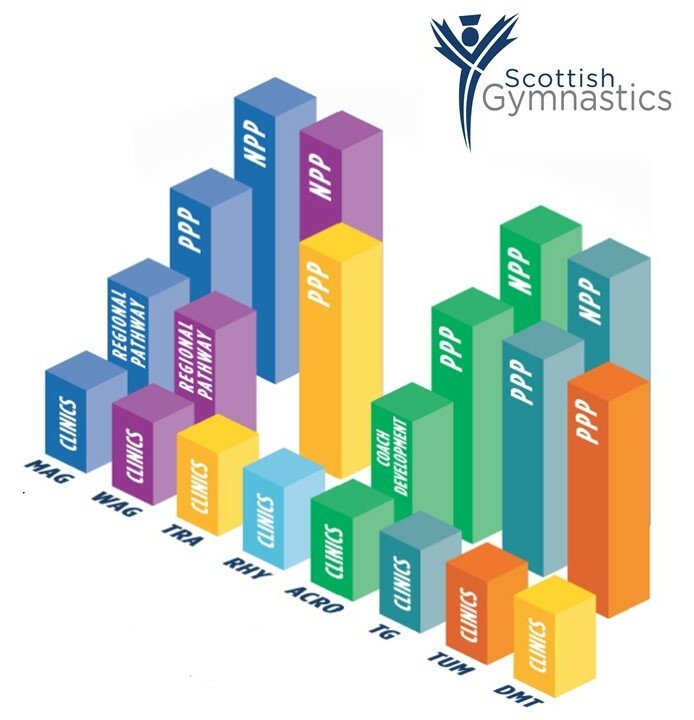 The Performance team leads and directs the implementation of Scottish Gymnastics’ Performance Strategic Plan to establish long terms goals with clear performance indicators. We oversee the international competition programme and lead an innovative structure of sports science support in conjunction with the Institute of Sport. The NPP supports coaches and gymnasts progressing on the talent pathway providing the next platform of support in technical development with input and learning from performance support services. The performance pathway programme specifically focuses on influencing the beginning of the talent pathway and provides opportunities for coaches and young gymnasts to gain technical development and educational support. Regional Training and Regional Pathway Coaches delivering mentoring and/ or leading regional training sessions specific to the needs of their regions. A programme to support the development of performances coaches, with enhanced coach mentoring and exposure to performance environments. NPP led by Scott Hann MBE delivered in a series of residential camps. PPP led by Matt Jackson delivered in a series of residential camps. Regional Training led by John Campbell (East), Douglas Ross (West). NPP led by Claire Barbieri delivered in a series of residential camps. Regional Pathway Coaches in West, East, Tayside, Fife, North, North-East. PPP led by Gary Short delivered in a series of two day camps. Series of Development Camps and annual symposium throughout the year. NPP & PPP led by Ian Said delivered in a series of one day camps. Performance Coach Development Programme based in South Tyneside GC with Ian Said. Annual Forum for coach CPD. NPP & PPP led by Chris Short and assisted by Tracey Brown delivered in a series of one and two day camps. Annual summer camp and Symposium, with workshops throughout the year for coach CPD. PPP led by Dan Lannigan in a series of one day camps. Development camps for coach and gymnasts throughout the year. Clinic for coach and gymnast development. Workshops throughout the year for coach CPD. ​For more information on our cancellation guidelines and policies, please click here.